Susan Wild, Democratic candidate in Pennsylvania's 7th Congressional District, speaks to a supporter after casting her vote Tuesday Nov. 6, 2018, in Allentown, Pa. Wild is facing Republican Marty Nothstein for the seat held by Charlie Dent, who retired. Here’s a look at some statewide trends in Pennsylvania. Pennsylvania had the distinction of having no women in Congress since U.S. Rep. Allyson Schwartz left office after the 2014 election. But that changed Tuesday. 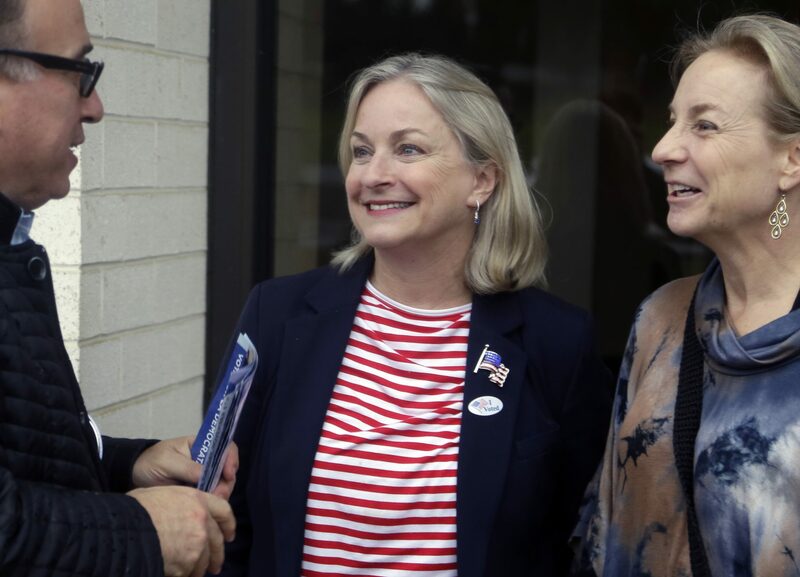 Four women, all Democrats, won election to Congress: state lawmaker Madeleine Dean, Air Force veteran Chrissy Houlahan and attorney Mary Gay Scanlon in the Philadelphia suburbs and attorney Susan Wild in the Lehigh Valley. Susan Wild, Democratic candidate in Pennsylvania’s 7th Congressional District, speaks to a supporter after casting her vote Tuesday Nov. 6, 2018, in Allentown, Pa. Wild is facing Republican Marty Nothstein for the seat held by Charlie Dent, who retired. The appointment of Brett Kavanaugh to the U.S. Supreme Court led to the possibility that the court could eventually overturn the Roe v. Wade decision of 1973. Democratic incumbent Gov. Tom Wolf promised to veto any abortion bans in Pennsylvania. Republican Scott Wagner Wagner wouldn’t commit. Wolf’s victory provide some certainty in Pennsylvania. Since Pennsylvania’s constitution was changed to allow governors to serve two terms, no incumbent lost — until Tom Wolf defeated Gov. Tom Corbett in 2014. But this year, Wolf won re-election — a return to tradition. Rep. Scott Perry, R-Pa., right, candidate for Pennsylvania’s 10th Congressional District, greets a voter outside the Carroll Township Municipal Building, Tuesday, Nov. 6, 2018, in Dillsburg, Pa.
U.S. Rep. Brian Fitzpatrick gets an F rating from the NRA. U.S. Rep. Scott Perry gets an A-rating from the group. Fitzpatrick is a member of the bipartisan Problem Solvers Caucus. Perry quit that group and is part of the conservative Freedom Caucus, a group known for taking a hard line on issues. Both Republicans were in toss-up races. But both managed to win: Perry in a central Pennsylvania district that includes Harrisburg, and Fitzpatrick in a suburban Philadelphia district for all of Bucks County. 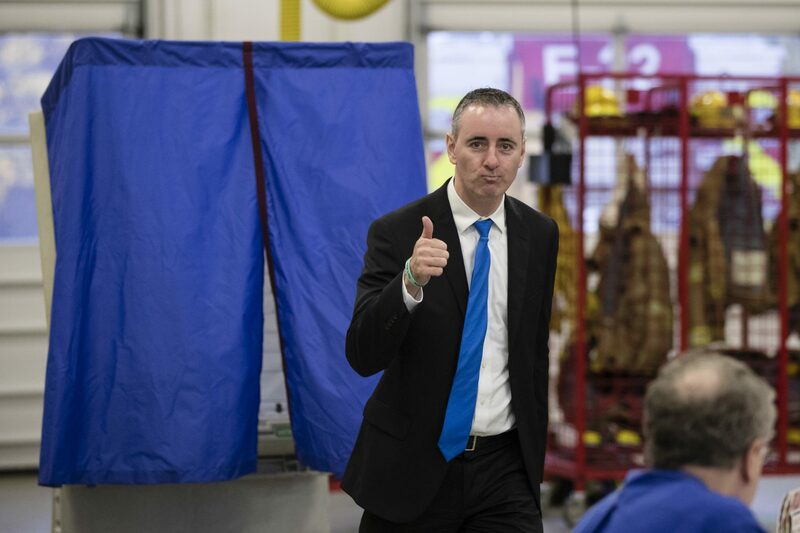 Candidate for Pennsylvania’s 1st Congressional District Rep. Brian Fitzpatrick, R-Pa., gestures after casting his ballot in Langhorne, Pa., Tuesday, Nov. 6, 2018. The Pennsylvania State Education Association and other labor groups gave a lot of money to Democratic Gov. Tom Wolf’s campaign. And Wolf has sided with unions on a number of important issues. For instance, he has opposed efforts to make Pennsylvania a “right-to-work” state, one where employees can’t be forced to pay union dues as a condition of employment. Wagner frequently clashed with unions and supported right-to-work legislation. In 2016, Republicans won 13 of the state’s 18 Congressional seats. Then earlier this year, the state Supreme Court tossed out the district borders, saying they were an unconstitutional gerrymander. The new map, along with a backlash to Republican President Donald Trump, led to a 9-9 split among Democrats and Republicans on Nov. 6. The next time the maps are drawn, after the 2020 census, Democratic Gov. Tom Wolf will be in office. So he will have veto power over any map he thinks is unfair. The National Democratic Redistricting Committee and former U.S. Attorney General Eric Holder, who served under President Barack Obama, focused on Pennsylvania as a key race this cycle. The action fund of the group, which supports increased gun restrictions, backed five Congressional candidates in Pennsylvania: one Republican and four Democrats. All five won, including Republican Congressman Brian Fitzpatrick in suburban Philadelphia. Fitzpatrick has supported expanded background checks, an increase in the minimum age to purchase a semi-automatic rifle, a ban on bump stocks, and gun violence restraining orders. Still, some supporters of increased gun restrictions question whether the endorsement of Fitzpatrick will pay off. The endorsed Democrats in Congressional races, meanwhile, were spread across Pennsylvania: Chester County; the Lehigh Valley; northeastern Pennsylvania and outside Pittsburgh. Maybe this was never really in doubt. But the strong showing of Democrats in the Philadelphia suburbs, combined with the fact that Republicans managed to win tight Congressional races in southcentral Pennsylvania and northwestern Pennsylvania, could give both sides hope for 2020, with Trump at the top of the ticket. And other states could look like steeper hills for both parties in 2020. Dave Wasserman, U.S. House editor of the nonpartisan Cook Political Report, wrote on Friday that 2020 will effectively be decided by six states. Michigan, Pennsylvania and Wisconsin in the Rust Belt and Arizona, Florida and North Carolina in the Sun Belt. Years before Donald Trump launched his bid for president by talking about drugs and rapists from Mexico, then-Hazleton Mayor Lou Barletta got national attention for a local ordinance that he said was aimed at cracking down on illegal immigration. Barletta, who challenged Sen. Bob Casey, was one of the earliest members of Congress to support Trump’s presidential campaign. Both Barletta and Wagner received the endorsement of the Pennsylvania GOP and went on to win their party’s nomination. But they trailed in general election polls by double digits for months. And they lost on Tuesday by double digits. Wagner, for instance, lost in Erie, Luzerne and Northampton counties — three counties that Trump flipped from blue to red in 2016. Republicans in multiple state legislative races were trailing early Wednesday morning, including state Sen. Tom McGarrigle in Delaware County. He conceded the race, according to the Delaware County Daily Times. If you’re looking for sea changes, note state Senate races in PA southeast. GOP incumbents McGarrigle & Rafferty will lose their seats. Quinn (R) loses 10th district bid to Santarsiero. Sen. Greenleaf’s son (R) loses the family seat to Collett. Williams (D) takes former GOP 38th. In Delaware County, state Sen. Tom McGarrigle was an early and prominent supporter of the same gun restrictions. Early in his campaign for governor, Republican Scott Wagner promised to “junk” school property taxes. And he stuck with that promise. But the idea of eliminating school property taxes frequently encounters a wide range of opponents. And school officials say it won’t provide enough money for education. The plan Wagner supported called for a personal income tax increase, a sales tax increase, and an expansion of what’s covered by the sales tax. Plus, Wagner said he would cut state funding to help pay for the increase. Gov. Tom Wolf, who won on Tuesday, has opposed full elimination of property taxes. In northeastern Pennsylvania, Republicans hoped to build on Donald Trump’s success there in 2016. In suburban Philadelphia, Democrats hoped to build on Trump’s unpopularity there. Both parties nominated a wealthy candidate for Congress who lived away from the district until fairly recently. In northeastern Pennsylvania’s 8th Congressional district, Republican John Chrin moved back to Pennsylvania after living in New Jersey, and he poured a lot of money into his own campaign. Vice President Mike Pence, House Speaker Paul Ryan and Eric Trump stumped for him. In suburban Philadelphia’s 1st Congressional district, wealthy philanthropist Scott Wallace challenged the Republican incumbent, Brian Fitzpatrick. Wallace grew up in Bucks County but had lived elsewhere for decades, spending time in the Washington, D.C., area and southern Africa, according to WHYY. The issue of where Chrin and Wallace lived wasn’t the only one in the races. But Democratic Congressman Matt Cartwright called Chrin “a Wall Street banker who lives in New Jersey.” In at least one interview, Chrin made a point of showing off his driver’s license and permit to carry a concealed a weapon as proof that he lived in Monroe County, Pa. Meanwhile, Fitzpatrick’s campaign said the fact that Wallace lived away from the district for so long showed he was disconnected.